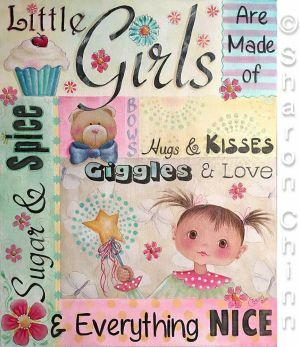 Little Girl Collage style canvas features cute girl with star wand, cupcade, teddy bear, funky flowers. Painted it on a 16″x20″ canvas and included a full-sized line drawing. There is also an 8″x10″ drawing in case you’d like to paint it on a smaller surface. I've use a variety of stencils for he backgrounds, but feel free to use what you have on hand or paint your own patterns. !DecoArt Traditions Acrylics with conversions to Americana.